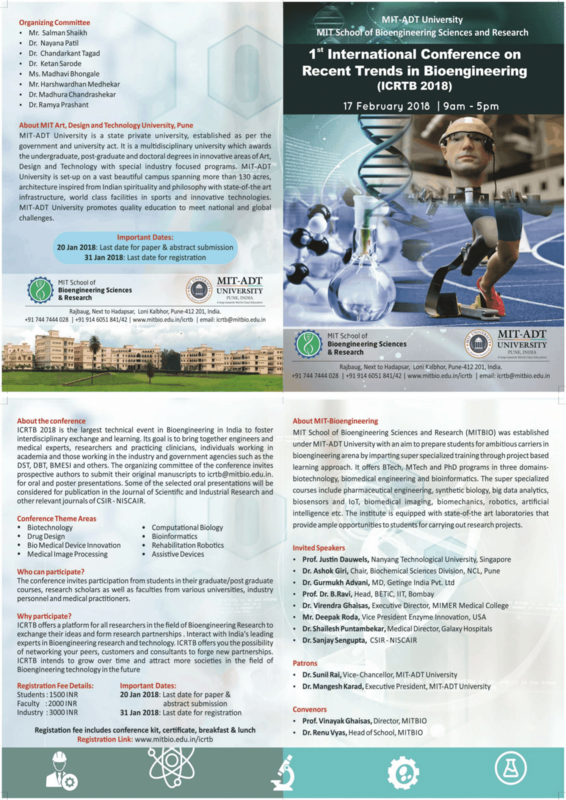 ICRTB 2018 is the largest technical event in Bioengineering in India to foster interdisciplinary exchange and learning. It s goal is to bring together engineers and medical experts, researchers and practicing clinicians, individuals working in academia and those working in the industry and government agencies such as the DST, DBT, BMESI and others. The organizing committee of the conference invites prospective authors to submit their original manuscripts to icrtb@mitbio.edu.in. for oral and poster presentations. Some of the selected oral presentations will be considered for publication in the Journal of Scientific and Industrial Research and other relevant journals of CSIR- NISCAIR.